Sahara Force India revealed its dynamic new look, offering a first impression of how the VJM07 will look when it is officially presented at Jerez test session. colours of saffron, white and green. 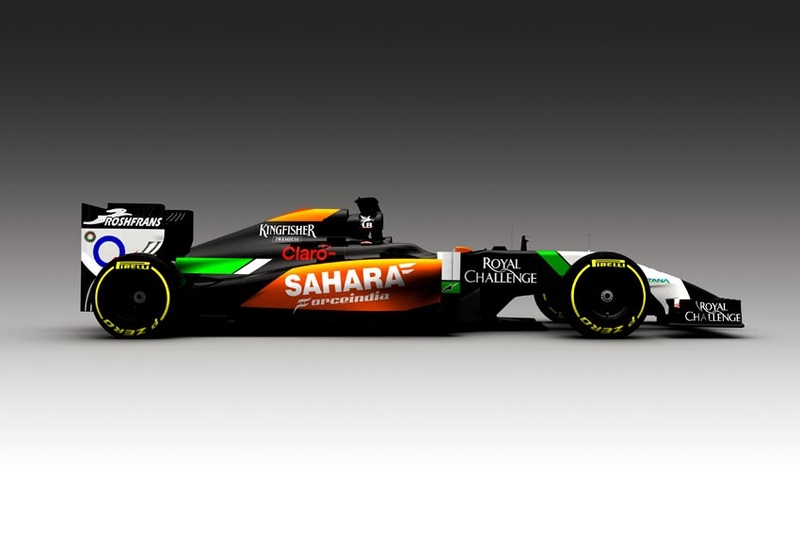 "The VJM07 looks stunning and the new livery reflects the way Sahara Force India is evolving," said Dr. Vijay Mallya. "I've always believed our cars have been the most eye-catching, but adding black as a main colour gives us a fierce new look." "It's been a busy winter for us on the technical and commercial front. When I founded the team my first ambition was to launch the first Indian team on the grid, but the next stage in our evolution is to develop a global brand. I think that ambition is reflected in the partners we are working with and our world class driver line-up. It certainly feels as though there is the potential for 2014 to be our strongest season yet." As well as new colours, the changes beneath the skin of the VJM07 are even more extensive due to the new technical regulations. "The new rules have presented us with a huge challenge, but I'm very proud of the approach we have taken and the direction of the technical team. "It will be fascinating to see how different teams have interpreted the rules and at this stage it's impossible to predict who has done the best job," he further said. Technical Director Andrew Green added, "Almost every single part is a new design, from the front wing right back to the diffuser. The genetics of the VJM07 still lie in the 2013 car, but we've had to achieve the same results in a slightly different way"
"It's been a massive job to accommodate all the changes to the power unit - it's the biggest change I've witnessed in the sport since I started in 1990. Cooling has been the biggest challenge with most of last summer taken up trying to understand the cooling requirements of the power unit, and how best to optimise it in the chassis."